By Simon Johnson. This post comprises the first three paragraphs of my latest Bloomberg column; you can read the full column there. Here we go again. Major shocks potentially threaten the solvency of some of the world’s largest financial institutions. Concerns grow over the ability of European leaders to shore up their banks, which are reeling from a sovereign-debt crisis. In the U.S., the shares of some large banks are trading at less than book value, while creditor confidence crumbles. Private conversations among economists, regulators and fund managers turn naturally to so-called resolution powers — the expanded ability to take over and wind down private financial companies granted to federal regulators by the Dodd-Frank financial reform law. The proponents of these powers, including Tim Geithner and Henry Paulson, the current and former U.S. Treasury secretaries, argue that the absence of such authority in the fall of 2008 contributed to the financial panic. According to this line of thought, if only the Federal Deposit Insurance Corp. had the power to manage the orderly liquidation of big banks and nonbank financial companies, the government could have decided which creditors to protect and on what basis. This would have helped restore confidence, it is argued. Instead, the government was forced to rely on the bankruptcy process, as in the case of Lehman Brothers Holdings Inc., or complete bailouts for all creditors, as in the case of American International Group. The FDIC already has limited resolution authority, which functioned well over many years for small and medium-sized banks. This entry was posted in Commentary and tagged Dodd-Frank, TBTF. Bookmark the permalink. Everything you predicted would happen since the last crisis is now happening. I hope the bankbots on the hill are happy with themselves. Lehman no doubt should have been handled differently, as should have citi been wound down. These 2 critical issues alone were sponcered by just 2 people, Paulson and Geithner. Until they explain themselves to the tax payer, no one can/shall be held responcible for createing a past or a looming crisis. I find this particularly interesting in light of Dexia (which is apparently too big to fail) and its current descent to failure (for the second time). One aspect of that is that Dexia passed the EBA’s recent stress tests with their focus on capital with flying colors only months ago. The whole idea that the stress tests would act to raise red flags for the regulatory agencies in their role of early warning mechanism is quickly falling apart. Simon’s piece reinforces the notion of Dodd-Frank serving mainly as *window-dressing*, designed to ameliorate the “pitch-fork” public reaction to the massive and unpopular bailouts of the TBTF, and the massive decline in collective and individual net worth. It wasn’t ever anything but a sweet lollipop to a crying baby, when the baby should actually have been given a more nutritious offering. Everyone involved in the legislation understood the trans-national status of TBTF’s, and we infer, also, the ineffective impact of those banking operations with respect to claims settlements, absent wider international co-operation and agreement. Surely this is daunting, containing a plethora of complicated legal challenges, but still, as it stands now, Dodd-Frank is basically a joke. Two Wall Street democrats have their name on this turkey; the crisis unabated, the center can not hold. And now, with a little help of their Basel Committee friends, it is going to be even worse because the “informal-too-big-to-fail” will now be able to acquire “formal-too big to fail” franchises, the Systemic Important Financial Institution SIFIs/G-SIFIs denominations, for a mere 2.5 percent in additional equity payable over many years. 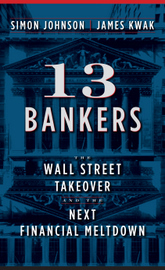 Not only will 2.5 percent of additional bank capital end up being almost meaningless in the case of a systemic explosion or implosion of these huge banks, but it is also probable that precisely those too big to fail banks that we least should want to be too big to fail, will be those most likely to exploit the franchise for all it is worth, in order to compensate the additional equity required, in the ways we would least like to see these franchises exploited. As Simon suggested, the answer is to bust up the largest institutions by separating investment from commercial banking. That would have helped us avoid much of the misery we’ve already encountered. We need to “ring-fence” those assets of multinational, TBTF banks that we need to protect depositors and non-profit US creditors. After that, screw them and their creditors. Banks aren’t going to get us out of this mess unless they start paying 100% interest on deposits and CDs, and we know that can’t and won’t happen. The only way out is a more equitable distribution of wealth because the spenders–the middle class–are tapped out after 30 years of believing that additional credit somehow was an acceptable substitute for a fair share of wealth. Unfortunately, during that 30 years, the institutions that assured the middle class its fair share of income (e.g. unions) were systematically undermined by the same folks who extended the credit and grabbed the percentage of wealth the middle class was losing. At this point, the so-called financial reforms of the past several years amounts to little more than rearranging the deck chairs, especially when the institutions responsible for implementing them (e.g. the Fed) have no interest in doing so. What to do? Deconstruct–not destroy–Big Finance and Big Banks to make them more responsible to the economy and society in which they operate. Strengthen–vis a vis Big Finance–the institutions that protect and advance the interests of the middle class. And until those efforts can be accomplished, institute a very progressive income taxation system on those who make the most. Oh yea, impose a 99% exit tax on those who try to move their wealth and genius to low-tax jurisdictions. Let them take their financial inventions (synthetic [fill in the blank]) to a casino elsewhere. But we keep the wealth that belongs to the U.S.
A very good article. One question, if we assume (a) lack of fiscal policy space (b) a relatively high degree of policy irrelevance as seems to be the case by now (c) monetary stimulus as basically the only way to avert deflation, how do we do monetary policy with a severely distressed banking system? You are right but I have a problem with macro and micro here. Is this a good time to do what should (and could) have been done during the dying days of the previous administration. I would certainly not be prepared to tinker with the European banks, despite my disgust over all those bailouts of banks run by incompetents and where both incompetents and reckless creditors will be ripping off the taxpayer again. But it is just too dangerous. Dangerous may be the exact word of the day. In addition to the southern tax problem was the slave problem Lincoln faced when contemplating the Emancipation Proclamation. The congress was leaning towards removal of the slaves as having been brought here illegally and hence legally removed. Not having enough support and knowing that should slavery become legal (equally equate todays new [1979/80] usury laws) the slaves and their strenght would one day overwhelm the plantation owners and most of the white mans territory too. The solution was to free the slaves and have them become an intregated part of society. Todays expodential results of the Carter years has produced a different type of slave, slaves to money. And this new group o slaves wont intregate so well with society because they are society. Lovin the smoke out on wall street. Anyone know what this is about…? 16 Trillion transfered from the lazy stupid no-good *poor*, via taxes, to the banks? “Let me repeat that, in case you didn’t hear me the first time. The GAO says that our Government HAS HANDED OUT $16 TRILLION TO THE BANKS. How much is $16 trillion? That is an amount equal to more than $50,000 for every man, woman and child in America. That’s more than every penny that every American earns in a year. That’s an amount equal to almost a third of our national net worth — the value of every home, car, personal belonging, business, bank account, stock, bond, piece of land, book, tree, chandelier, and everything else anyone owns in America. That’s an amount greater than our entire national debt, accumulated over the course of two centuries. The Government gave $16 trillion to the banks. And nobody else is talking about it. Think about it. Think about what that means. Its been thought about, the 30 year e-bonds are/have been paying a hugh interest rate which basicly has and will continue to tap the financial coffers of the gvt which made those promises. The only solution was/is to default and that can only be leveraged at a time of debt ceiling negoiations, our next opportunity is after the election so there is no hurry, we just resolved the prior one last Aug. w/ a big fight. @foof – You are NOT an American, are you? So you are openly admitting to stealing from taxpayers? Seriously, I KNOW homeland insecurity is monitoring this blog – isn’t this dude a financial terrorist? The article is true, but not true enough. When Prof. Johnson looks at economics, he sees politics. When he looks at politics, he sees ideas. (He is what philosophers of yore called a “philosophical idealist.”) Yes, the situation is ripe for further disaster because the nation states do not want cross-border resolution authority or preventative action imposed upon them. But why is this so? is the question not asked. The obvious answer lies in the hypothesis that the class that dominates the nation states in question–the corporate capitalist elite–does not want the stated policies, and their flunkies in government do their bidding, as usual. “Politics is the vehicle of economics,” as Rosa Luxembourg put it. Of course, well-meaning reformists such as Prof. Johnson must minimize or deny the class/economic question as they promote their latest good ideas, lest the reality dawn that we cannot have our corporate capitalist cake and eat it too (with reforms). Then the reformists wonder why their stellar ideas seldom are implemented; which never stops them from intoning, This Time Is Different . . . .
Only so much as your a financial dimwit. Who cares who is monitoring this blog, or what they can or can’t do about it, first amendmenant rights for those of us who actually use our brain for more than complaining. I could be a diplomat to 15 foriegn countries, or a senators son. You could (although I have proof you are) be living on borrowed time, enjoy it or leave the room. Didn’t your mom TEACH you that if you have something nice to say about someone,[rather than something] don’t say nothin at all. But go right ahead and dis respect your mom, thats hones t type work for lowbrows. Interesting post. The argument that you have used here is interesting although I have a different point of view! But if you can provide more evidences for your argument, it will have more thrust behind now. Now it seems more as opinion based.